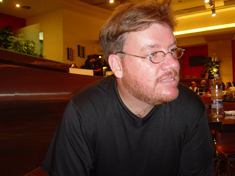 Sinan Antoon is a poet, novelist and translator. He teaches Arabic culture at New York University. He studied English literature at Baghdad University before moving to the United States after the 1991 Gulf War. He received his Master’s degree in Arab Studies at Georgetown University and a Ph.D. in Arabic Literature at Harvard University. His poems and articles (in Arabic and English) have appeared in prominent publications in the Arab world and the United States. He has published a collection of poems Mawshur Muballal bil-Huroob (“A Prism; Wet with Wars,” Mirit Books, Cairo) and a novel I`jam (“Diacritics,” Dar al-Adab, Beirut). Sinan returned to Iraq in 2003 to co-direct/produce the award-winning documentary About Baghdad about the lives of Iraqis in a post-Saddam occupied Iraq. He is a Senior Editor at the Arab Studies Journal, and a member of Pen America. He is a contributing editor to Banipal and a member of the editorial committee of Middle East Report. Sinan is co-founder of Quilting Point and served as the language consultant for this documentary series.